All of our TouchPoint documentation is online and is comprised of ‘how-to’ articles, definitions, or processes with other links to provide further information when needed. We also have links to videos and some articles have videos directly embedded in the article. 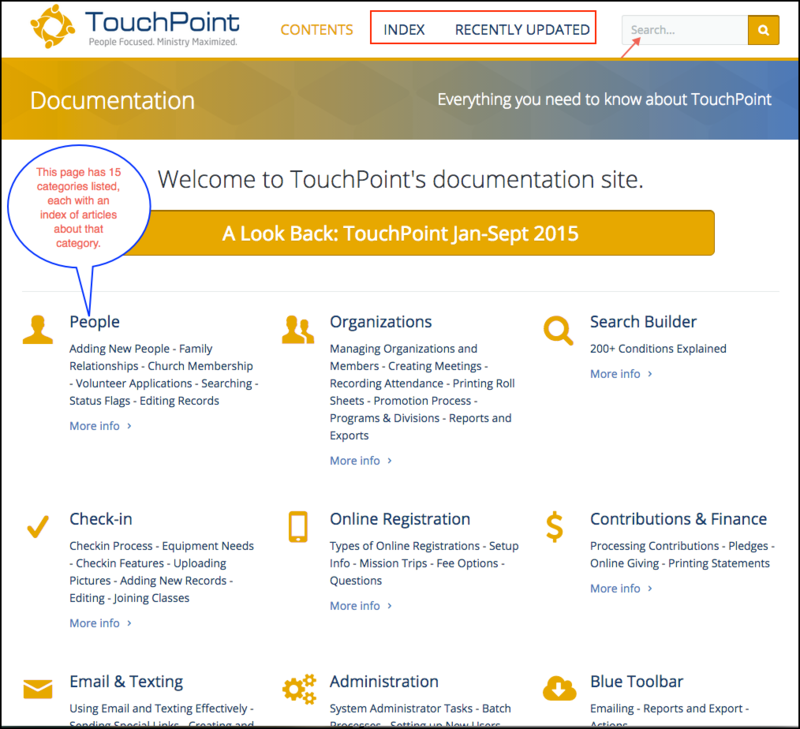 TouchPoint Documentation can be accessed by clicking ? Help located in the top right corner of your database. This will open another tab in your browser, leaving the TouchPoint page on the original tab. You can easily return and continue working. Type a key word or phrase in the Search box. See below for more options regarding searching documentation. Click the blue Documentation Website button. See below for more information about accessing documents from the homepage. Select Contact Support tab and submit a Support Request via email. See section below regarding submitting a Support Request. We ask that you please try to search the documentation website before contacting Support. If you do not easily find the answer to your question then please send a detailed support request. After you enter a key word and press Search, you will come to the Search Page for the documentation where you will see a list of matches. You can click the one that appears most relevant to your question. The original tab for your TouchPoint database. Click that tab to return to work. The Help / Search tab where you can return if you need to submit a support request. And the tab with the help article. After you initially enter a key word and press Search you will be on the Search Page where the list of matches will display. You can click a link to open the help article or you can search again. 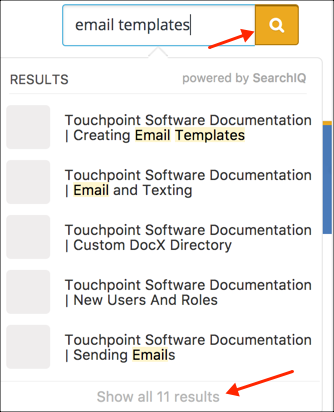 You have two options for searching the documentation using Support IQ search - Quick Search or normal Search. Enter a key word or phrase relating to your question in the Quick Search box in the top right of the screen and, as you type, a list will display below the text box displaying top hits matching your search term. Select one of those if you see what you need. To view the entire list of matches press Enter, press the Search icon, or select View All at the bottom of the list. Enter a key word or phrase in the normal Search box. When you click search a top hit list will display first with all the other matches to your search criteria below that. 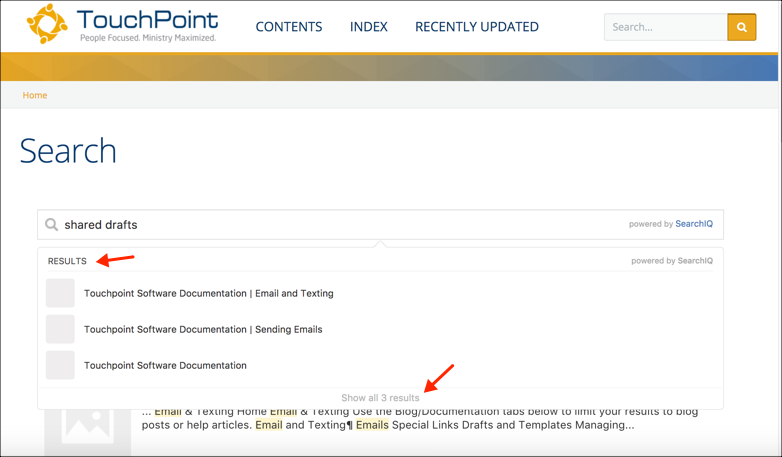 If you are viewing the Documentation Homepage, you will still have access to the Quick Search box. It will continue to display in the top right corner of the screen even when you are viewing a help article. This makes it so easy for you to find another article without having to return to your database and click ?Help again. 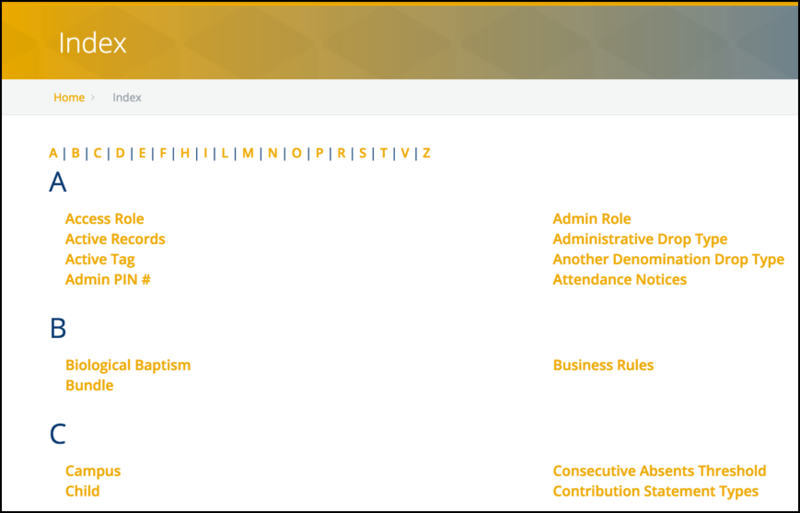 Click the Index for a glossary list of keywords or concepts. Each is a link to help article where that word / concept is defined as it is used in TouchPoint. The Index is a good place to look first. This page displays the various categories. We have quite a few of them, each with help articles relating to that category. Just click the icon or More info for the category you are interested in. This will display the list of articles relating to that topic, grouped by type. This is a list of the help articles that have been updated in recent days / weeks. We are continually working to improve our documentation; so, just because an article has been updated, does not necessarily mean there is a new feature described. Sometimes, we rewrite articles in order to make the explanation easier to understand or change a screenshot when there has been a minor change. Once you click one of the categories, and then select an article, there are ‘breadcrumbs’ to allow you to very easily return to the previous article(s) you have viewed. If you do not find what you need in the documentation, return to the tab in your browser that initially opened when you clicked ?Help . Select the Contact Support tab on that page. We value you as our client and work hard to provide excellent support. So, please notice the suggestions/protocols in the following article regarding how to get the most from your support request, so we can answer your question as quickly as possible without a lot of back and forth emails.